While motorcycles are as popular as ever and there’s something seriously attractive about a man or woman that can drive a bike (and drive it well! ), it can sometime be difficult to meet likeminded people to get to know on a close level. Biker groups and clubs exist all around the world, but wouldn’t it be easier to skip a few steps and meet a fellow leatherclad petrolhead online? Welcome to the world of biker dating! If you’re new to online dating altogether, there are a few things you should certainly make yourself aware of before wading in – biker or no biker! • Find the right site for you – with our help, finding the right kind of biker dating site has never been easier. You’ll be surprised as to just how many different platforms there are for motorbike enthusiasts to find each other! Why not have a look through our reviews for some in depth looks at some of the biggest and best biking personals around? • Keep personal information to a minimum. While it’s great to mention what bikes you ride and aspire to own, it’s very important to ensure that you don’t disclose any identifiable information about yourself on any biker dating sites. By this we of course mean your full name, your address and other contact information – don’t forget that anyone you’re talking to could be absolutely anybody – so take things slowly, regardless of how fast you like to go on your two-wheeled wonder! • Build a great profile! This doesn’t just mean a fantastic photo – preferably one where you’re smiling or maybe even pictured with your bike – but really put effort into your personal statement. There’s a balance, too – so keep it short, but give enough information for people to be able to contact you and want to keep conversation going. Ice breakers are great and if you can help other people out, well done! • Be proactive! You won’t get anywhere on any of the biker dating sites we review unless you take the bull by the horns and make an effort to speak to people – what do you have to lose? If someone interests you and you’d like to get to know them better, take the plunge and ask them a question or two. • Read the terms and conditions. While all of the biker dating sites we review and showcase are legitimate, we can’t emphasis this enough – never hand over any personal or banking information unless you are certain that you are entering into a paid subscription and that you are doing so over a secure (SSL) connection – this will make sure that your payment information is being sent over a secure server that can’t be intercepted. For more information on SLL certificates, your browser will normally highlight a ‘padlock’ symbol on your address bar. • Above all – have fun! Dating is meant to be light-hearted and leaping into things with too much emphasis on the future could let you down and provide disappointment. 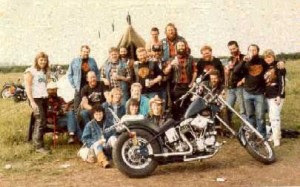 Take every message as it comes and goes and enjoy talking with likeminded bikers – and if you need help finding even more opportunities to connect with your fellow revvers, rely on us to bring you even more biker dating sites as and when we find them!